I LOOKED back at the iconic Rock as we sailed away with the wind in my hair – and a little less glamorously – the spray in my face. We were on board Dolphin Adventure’s catamaran in search of dolphins in the Bay of Gibraltar. As it turns out, the bay is the permanent home of three different species; common, striped and bottlenose, with transient dolphins visiting the bay for food, shelter and to breed in their hundreds. They are attracted to the area by the clean water coming from the Atlantic which is rich in nutrients and brings lots of smaller fish such as sardines and mackerel that the dolphins feed off. We had been warned as we set off from Marina Bay that you see fewer dolphins in winter and there was a chance our search would be in vain, but everyone on board remained optimistic as we scanned the waves. Sure enough minutes later we spotted a pod of around 20 striped dolphins and our captain Angie headed straight for them. 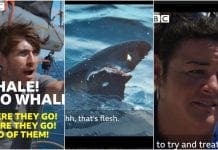 “To be honest we almost always see dolphins and if punters are unlucky we give them a voucher so they can come back another day for free,” explains our guide Georgia Pritchard, who has worked for the company for a year. 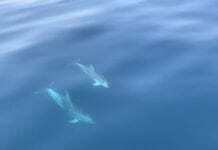 “There are literally hundreds of dolphins in the bay. In the winter you see them in pods of between 15 and 50 but in the summer they come together and you can see them in their hundreds. 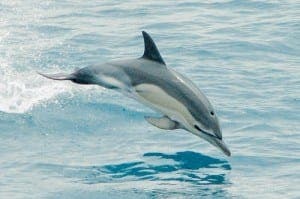 “In the wild they live for 35 to 40 years whereas in captivity the common dolphins live for 15 years,” adds Georgia. It was a magical feeling to watch these creatures in their natural habitat, with the common and striped dolphins playing together. They had soon come right up to the boat, swimming at our feet and playing with us, seemingly as curious about us as we were of them. You could even hear them breathing as they came up for air – they can hold their breath under water for up to five minutes – and swam around and under the boat. I was completely mesmerised watching them and time stood still until they vanished just as quickly as they had arrived. It was clear from the smiles on board, that everyone had enjoyed the experience as much as I had. “It is the best job in the world,” smiled Georgia. You had to agree, it couldn’t be far off.